An energy audit should be undertaken before energy-improvement measures are implemented. The audit evaluates the building’s current thermal performance and identifies any deficiencies in the building envelope or mechanical systems. Local utilities may offer simple audits at no cost or more in-depth audits for a reasonable fee. 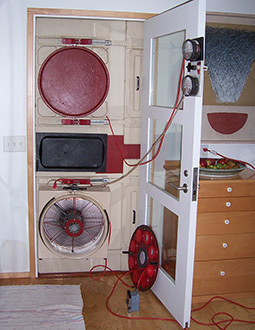 The blower door test is a standardized diagnostic tool that measures the air tightness of a building envelope. The energy audit measures the R-value of various components of the building envelope including walls, ceilings, floors, doors, windows, and skylights. The R-value is a construction industry standard of measurement of resistance to thermal transfer, commonly known as heat loss; the higher the number, the better the resistance is to heat loss. The audit also includes inspection of the building envelope to identify areas of air infiltration. Tools such as a blower door test blower door test or infrared thermography may be used to identify specific areas of infiltration, lack of insulation or thermal bridging. The type and age of mechanical systems and major appliances are also recorded. The results of the energy audit will identify current deficiencies in the building and will help you select the most cost-effective remedial measures, such as added insulation, caulking, lighting improvements, and repair or replacement of mechanical systems or major appliances. Once you diagnose where problems exist you can determine which improvements will be the most cost effective and will provide the maximum comfort and energy savings. Find more information about home energy audits at Energy Star or learn how to perform a simple energy audit yourself. First, make a list of obvious air leaks or drafts. The potential energy savings from reducing drafts in a home may range from 5% to 30% per year, and the home is generally much more comfortable afterward. Check for indoor air leaks, such as gaps along the baseboard or edge of the flooring and at junctures of the walls and ceiling. Inspect windows and doors for air leaks. See if you can rattle them, since movement means possible air leaks. If you can see daylight around a door or window frame, then the door or window leaks. You can usually seal these leaks by caulking or weather stripping them. Check the storm windows to see if they fit and are not broken. If your basement is unheated, determine whether there is insulation under the living area flooring. In most areas of the country, an R-value of 25 is the recommended minimum level of insulation. The insulation at the top of the foundation wall and first floor perimeter should have an R-value of 19 or greater. If the basement is heated, the foundation walls should be insulated to at least R-19. Your water heater, hot water pipes, and furnace ducts should all be insulated. For more information, see Install insulation.